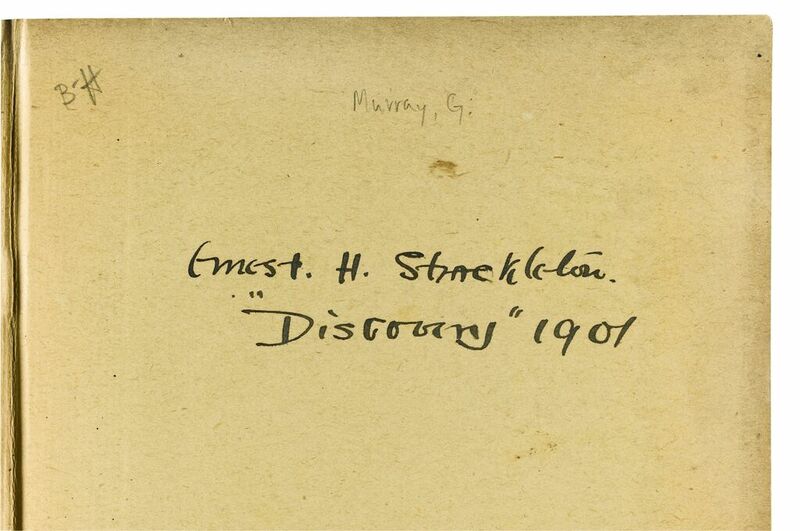 Born in Kilkea, County Kildare in 1874, Ernest Shackleton was a major figure in the history of Antarctic exploration. He was a member of Captain Scott’s Discovery Expedition in 1901-1904, before leading his own British Antarctic (Nimrod) Expedition in 1907-09. 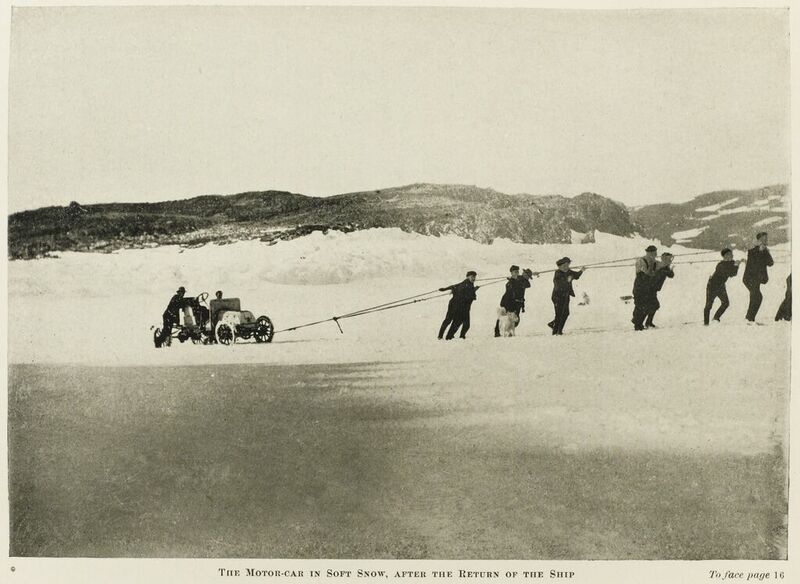 The sledge in the sale was used on the Nimrod expedition by Eric Marshall – one of the four men, with Shackleton, Jameson Adams, and Frank Wild, to undertake the sledge march to the South Pole. Although they had to abandon the attempt, they reached within 100 geographical miles of the Pole – at the time, the furthest south ever travelled. It is estimated at £60,000-100,000. The four men of the Southern Party were accompanied on their journey by four ponies, each pulling an eleven-foot sledge. During the march, the ponies gradually succumbed to the conditions; three had to be humanely killed, and the last fell into a deep crevasse nearly taking the supplies and Frank Wild with it. Two of the four sledges were left where the first two ponies had been put down, as depots for the return journey. The two remaining sledges went further south. 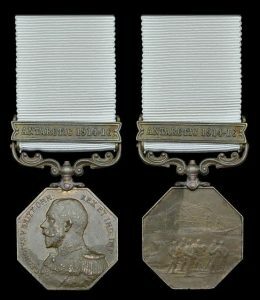 THE Polar Medal awarded to Timothy McCarthy from Kinsale who sailed to South Georgia in the Antarctic with Shackleton comes up at auction in London on July 22. The unique bronze medal awarded to the Royal Naval Reserve Able Seaman for the epic 800 mile journey across the sub Antarctic Ocean is expected to make between £15,000 and £20,000 at Dix Noonan Webb, the international coin, medal and jewellery specialists. McCarthy sailed with Sir Ernest Shackleton in the 20 foot long boat James Caird from Elephant Island to South Georgia in 1916. 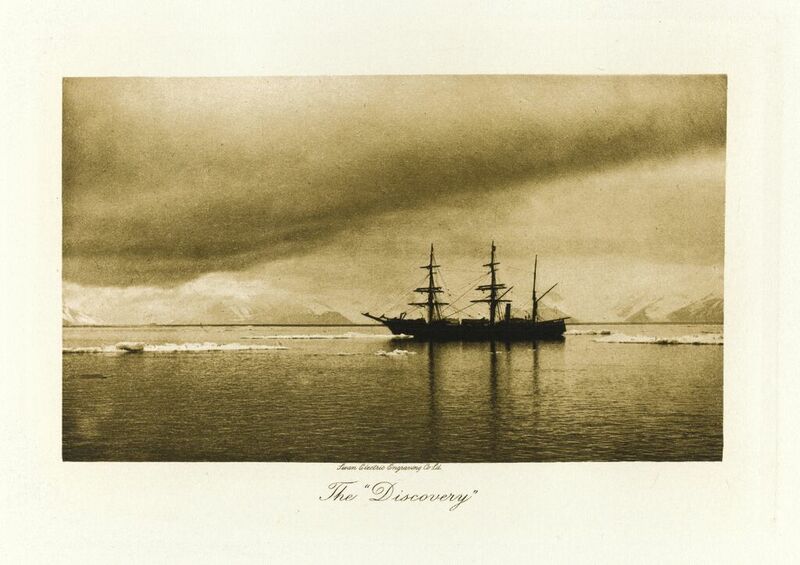 The 16 day journey to get help for their shipmates from the Polar exploration ship Endurance became one of the greatest maritime stories in history. Shackleton paid tribute to his shipmate: “McCarthy, the best and most efficient of sailors, always cheerful under the most trying circumstances and who for these reasons I choose to accompany me on the boat journey to South Georgia”. The Kinsale man was one of just 26 selected to crew Endurance, whose aim was to cross the Antarctic continent, a journey of 1,800 miles. They set sail in August 1914. The following January Endurance was held up by pack ice in the Weddell Sea and later that year, damaged by the pressure of ice, was abandoned and later sank. 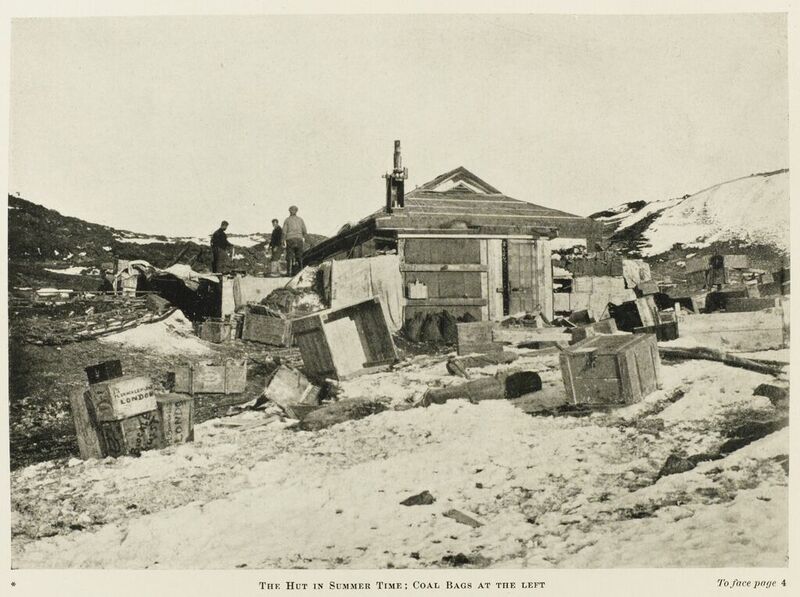 The crew established base camp on an ice flow but as supplies dwindled it was clear that help would have to be sought. 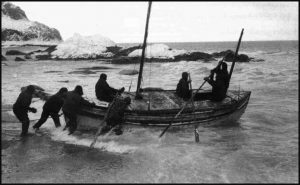 Six men set out on the James Caird for South Georgia, where there were whaling stations. After their rescue McCarthy was sent back to Britain with Shackleton’s warm gratitude. He was almost immediately thrust into service aboard the armed oil tanker SS Narrangansett. This ship was torpedoed and sunk off the south west coast of Ireland on March 16, 1917 and McCarthy was one of 46 sailors who lost their lives. 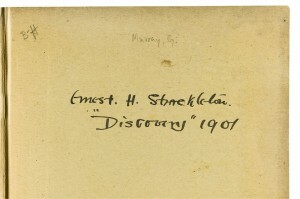 UPDATE: IT SOLD FOR £65,000: THE ATHY, CO. KILDARE HERITAGE MUSEUM DEDICATED TO SIR ERNEST SHACKLETON WAS THE UNDER BIDDER. The James Caird being launched from the shore of Elephant Island in April 1916. 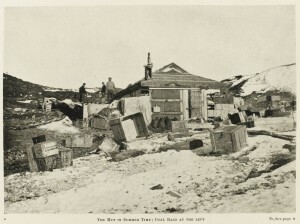 The finest private collection of books relating to the polar explorers Robert Falcon Scott and Ernest Shackleton will come up at Sotheby’s in London on September 30. 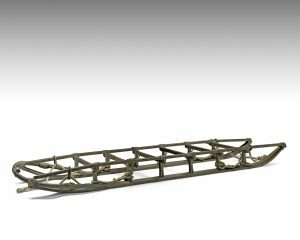 The auction is 100 years on from Shackleton’s epic “Endurance” expedition, considered the final great voyage of the “heroic” age of Antarctic exploration. Pioneering publishers and writers, they produced some of the most outstanding and rare of all travel books, recounting their great feats of adventure, ill-fated voyages, daily lives and discoveries in the South Pole. Highlights including the first book printed in Antarctica, Shackleton’s Antarctic handbook and a facsimile of the South Polar Times (the newspaper produced by Scott’s men in the Antarctic). The collection is from the library of Franklin Brooke-Hitching. He has assembled the most magnificent private collection of English language books charting the discovery of the world over 40 years. The motor car in soft snow after the return of the ship. (Taken during the British Antarctic Expedition 1907-1909.